A motion that would support one of the five alternatives for the 710 North project — to improve local roads — as the project’s ‘locally preferred alternative’ was approved on a 3 to 2 vote Wednesday by the Metro Board of Director’s Ad Hoc Congestion, Highways and Roads Committee. 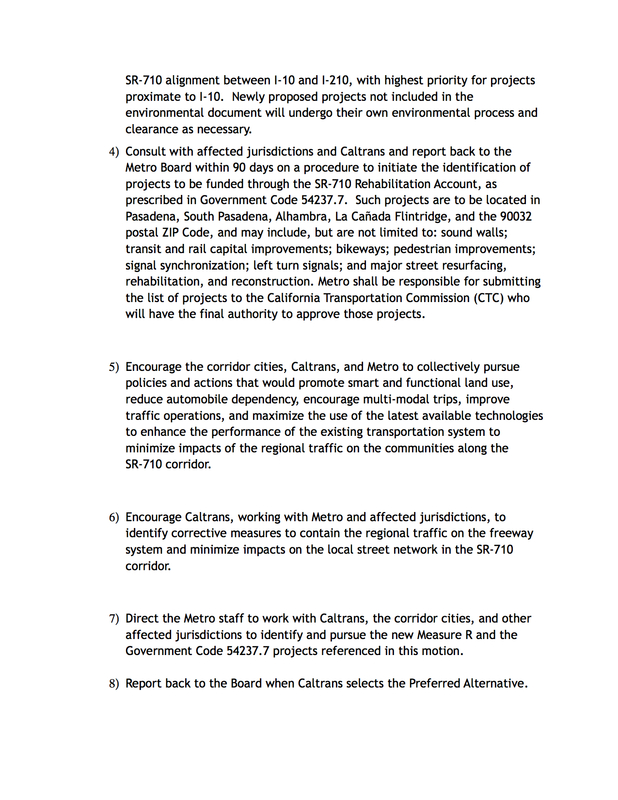 The motion is part of an item that includes a status report (posted below) on the project’s environmental study and the performance of the different project alternatives, including a single bore freeway tunnel with truck restrictions. The alternative’s official name is “Transportation System Management/Transportation Demand Management” (TSM/TDM) and includes traffic signal upgrades and synchronization, local street and intersection improvements, improved connections to existing bus service and the promotion of rideshare in the area around the gap in the 710 between Alhambra and Pasadena. These are the kind of projects that Metro staff have said could provide immediate travel benefits. The motion is posted above. Something worth highlighting: the motion calls for spending $105 million on the TSM/TDM alternative and using the remaining project funds — potentially hundreds of millions of dollars — for new mobility projects in the San Gabriel Valley area. Please see the motion for details. In committee, the ‘yes’ votes were from Board Members John Fasana, Kathryn Barger and Ara Najarian and the ‘no’ votes were from Jacquelyn Dupont-Walker and Janice Hahn. The full Board will consider the item at their meeting next Thursday (May 25) at 9 a.m. The public can listen and watch Board meetings online. After the State Route 710 North study team compared and weighed the benefits and impacts of a range of multi-modal alternatives, reviewed approximately 8,000 comments received during public circulation of the State Route 710 North Draft Environmental Impact Report/Environmental Impact Statement, and completed the performance evaluation for each of the five alternatives studied over the past few years, the alternative that best addresses the purpose and need of the project and the performance measures set to evaluate all alternatives considered in the environmental process is the Single Bore Freeway Tunnel (SBFT) with tolls and truck restrictions. The alternative reduces regional and local congestion associated with north-south travel demand within the study area and delivers the best transportation performance and benefits with the least environmental impacts. However, the alternative is not fundable in the foreseeable future. 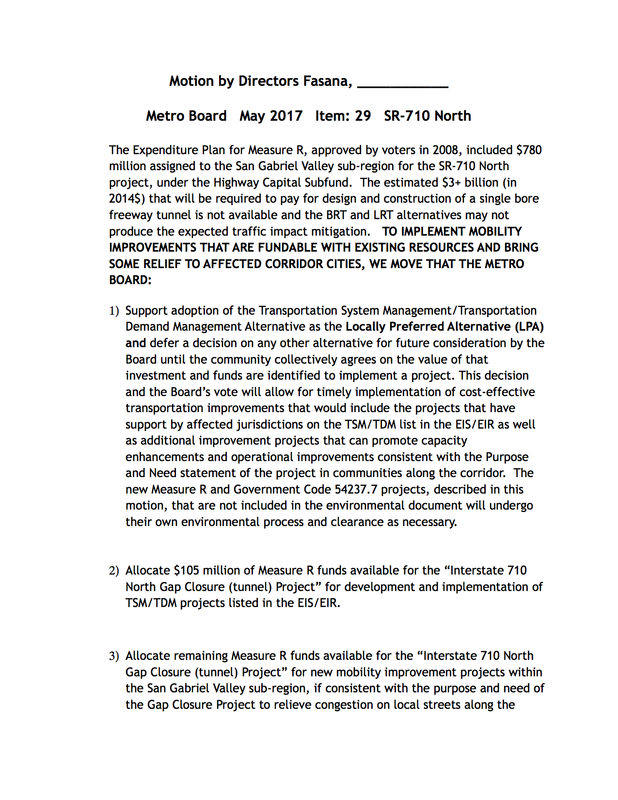 On Wednesday, May 17, the Ad-Hoc Congestion, Highway and Roads Committee of the Metro Board voted to receive and file a status update presented by staff and approved recommending a motion, introduced by Metro Board Chair John Fasana, that the Metro Board will consider at its meeting on Thursday, May 25th. Adopt the Transportation System Management/Transportation Demand Management Alternative (TSM/TDM) as the Locally Preferred Alternative. Allocate $105 million of Measure R funds to develop and implement the projects listed in the TSM/TDM alternative. Allocate the remaining Measure R funds towards new mobility improvement projects within the San Gabriel Valley to relieve congestion. It is anticipated the final environmental document for the SR 710 North Project will be completed by the first quarter of 2018. Upon completion of the environmental document, California Department of Transportation (Caltrans) District 7 will select the Preferred Alternative. please visit metro.net/sr710study or call 213.922.7479. Copyright © 2017 Metro, All rights reserved. Here is is the project homepage, which includes much more background about the project. Here is an FAQ that explains the roles of Metro and Caltrans in the study as well as project funding. It is refreshing that the “Congestion Committee” voted for the least costly alternative to building a 710 toll tunnel under Pasadena. I am surprised though that Board member Fansa voted for it, because he has a long history supporting a toll tunnel, and Board member Hahn voted against it because she has a long history of supporting modern, progressive and clear-thinking plans for LA. Why this outcome? Maybe only a fly on the wall is some dark corner of the “Taj” may know. But, the bottom line is the age of the auto in LA is on it’s death bed. The future is public transit. It really makes a lot of common sense when you think about it, do the least harm first, then if it does not work, Metro can always revisit the tunnel idea. Meanwhile, use the excess taxpayers’ funds to run the popular Gold Line to Glendora, Claremont and Ontario Airport. The future is not public transit. The future is the car. Autonomous cars will only make transit more obsolete. This is even proven in countries that are rapidly modernizing(BRIC) that are seeing huge growths in the car industry because it has been shown when people can afford cars they will use it. Not in the short term. I know that as much as I want a self-driving car, it’ll probably be another 2 decades before I can even consider buying one new. I can already imagine how expensive these cars might initially be on the market. Given that there is “no funding for the foreseeable future” for the tunnel option this is a reasonable move. But unless someone invents teleportation first there will have to be a tunnel someday. I know its not part of the study, but I say clear the path and put a freeway where there at to be one! That would be nice but it isn’t happening. So the tunnel is the only option. Thankfully they aren’t supporting the stupid rail proposal. Rail is smart; not stupid. Rail transport has been proven worldwide to be the safest, fastest, and least harmful to the environment of all forms of mass transportation. Honestly, a lightrail and more bus routes would be awesome, but would do nothing for those with cars. That’s the problem after all isn’t it? That and the problem it is essentially just the a Gold Line connector. Don’t get me wrong, a southern extension would have ridership potential but I think this alternative rail line should be serving all SGV cities (Alhambra, San Gabriel, Temple City, Rosemead, South Arcadia) before finally meeting up with the Gold Line in Monrovia. This 3 mile straight line, while partially serving Cal State LA and Alhambra, probably won’t spike up ridership in any way. The problem is, as proven by UCLA, that when more freeway miles are opened, ultimately more cars, trucks, congestion and smog results. Short sighted studies. It doesn’t take into account that traffic will drawn off of existing freeways. Cars aren’t going anywhere and not building new infrastructure for them is not the answer. We need to keep investing in freeways and roads for drivers. Of course as the city grows new drivers will be added. But new drivers aren’t going to pop out of nowhere because a new road or freeway is built. What a ridiculous notion. Further, it’s common sense that if your commute via car is a nightmare and there are other options available, you’re going to look into them. If a driving takes 2 hours in traffic, and a train takes an hour and 15 minutes…you’re probably going to want to take the train. If the freeway is clear and reduces commute time, you will take the freeway. Widening freeways will just lead more people to drive and will absolutely add vehicles on the road. I think you should focus your argument on self-driving buses or other higher capacity vehicles if you want to go with that line of reasoning. Are you expecting every person in the county to magically be able to afford a self-driving car in the future? Let’s get this tunnel built! A strongly connected freeway system will benefit the thousands of drivers that will use this daily. Sorry, but this option, while it is undoubtedly the least expensive, is also the one least likely to accomplish anything. You may be right but who knows? TSM/TDM have never been tried. Given how long (actually, not pie-in-the-sky projections) it will take to complete a tunnel, at least some mitigation to the current situation will happen. We might actually learn, in a relatively low-cost manner, whether or not there are other alternatives that provide concrete improvements. Ah, the wisdom of maturity! Incidentally, you’re needed at 1600 Pennsylvania Ave.
Thing is in this case all the options aren’t popular at all with anyone and really, I think if we were to go with one of the public transit options, we needed to “think outside the box” by which I mean a rail line that serves outside the study was necessary in this case.